FiberFix Reviews - Is it a Scam or Legit? Based out of Orem, UT, FiberFix is a fiber-resin wrap that claims to “harden like steel in minutes,” and to provide a permanent fix to a wide variety of materials even leaking pipes. 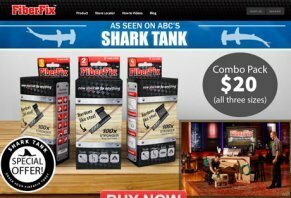 FiberFix was originally featured on the popular television program “Shark Tank” in late October 2013, and was invested in by Lori Greiner, who is considered to be the queen of QVC. During the show, Ms. Greiner invested $120K of her own money into the company for a 12% stake. Because of the product’s newness, FiberFix is not listed with the Better Business Bureau, and has minimal online reviews. However, those that do exist seem to be overwhelmingly positive. First, wet your FiberFix roll by submerging it in water, and then removing any excess. With latex gloves covering your hand, wrap your FiberFix roll around whatever needs to be repaired, and let it sit for a few minutes. However, most online reviews we found recommended letting it sit for at least 24 hours to achieve optimal hardening. The manufacturer claims FiberFix can be affixed to almost any material, including metal, wood, plastic, rubber, and more. In addition, it is claimed to be 100-times stronger than duct tape, weatherproof, heat and cold resistant, and can be sanded to become unnoticeable on wood surfaces. Based on the few online reviews we could find, FiberFix really does provide a lasting solution to broken items that would otherwise be impossible or very costly to repair. The only caveat is that FiberFix is not intended to be a patch; in other words, the material’s strength comes from layering, so cutting off a small piece and using it as a single layer will likely not provide the results you’re looking for. Also, because FiberFix will adhere to literally any material even your hands you must wear latex gloves when applying. If you purchase FiberFix directly from the manufacturer, it is currently offered at $19.95 per set, which includes one 1-inch roll, one 2-inch roll, one 4-inch roll, in addition to one pair of latex gloves, and one sandpaper strip. However, like most “As Seen on TV” products, you’ll receive a second FiberFix set with your order, but will have to pay an additional $7.95 shipping and handling, bringing your total to $35.85. If you live outside the continental U.S. or in a U.S. territory, you’ll also be required to pay an additional $10 surcharge. All FiberFix products come with a 30-day money back guarantee, less shipping and handling charges. This means you’ll be out $15.90 in shipping and handling fees, in addition to whatever costs you incur sending it back to the manufacturer. Keep in mind that this is typical of the vast majority of “As Seen on TV” products, and is how they make the bulk of their money. With this said, it’s important to note that FiberFix is also available through Amazon.com, Home Depot, Ace Hardware, Lowe’s, QVC, eBay, as well as a wide variety of other retailers. Because of the expense of returning FiberFix to the manufacturer should you not be happy with its performance, we would highly recommend purchasing through a standard brick-and-mortar retailer. Relatively inexpensive solution to fix items that would otherwise be too costly, or too labor intensive to repair. Can be quickly applied to a wide variety of surfaces. 30-day money back guarantee, when purchased directly from the manufacturer. Online reviews seem to be overwhelmingly positive. Very new product, so we’ll have to see how FiberFix performs over time. If purchased from company’s website, cost to return can be almost as much as the product itself. I saw the tape at Lowe's and decided to give it a try before calling a plumber. I used the 2-inch tape to seal a hole in a galvanized steel drain pipe elbow. The hole was about 1 inch long and 1/4 inch wide. I cleaned around the hole with the sandpaper provided and followed the instructions for soaking the tape and quickly applied it to the pipe. I wrapped it tightly around the pipe several times, layering it. In ten minutes the tape was as hard as the pipe. I can't say how long it will last, but it was applied a few months ago and is still sealing the hole. I did get the impression that following the directions closely is very important. The tape does set up very fast. There is no way I would have tackled the job of replacing that 4-inch diameter elbow and the attached pipes myself. I would have had to pay a plumbing company to do it at a huge expense. I am very happy with the results I got, and highly recommend Fiber Fix tape. Considering my experience with the tape, I have to assume that those with a poor result did not follow the instructions for its use. I followed the instructions to the letter - putting the tape in room-temp water for ten seconds, squeezing it dry, wrapping it tightly, and letting it set up for ten minutes - and it didn't even stick to itself. It didn't seem to have any resin on it. At least the gloves are reusable, and I also got a very small square of sandpaper. I have no idea if this is a good product or not. The resin is dried out and the blue light is not functional. DO NOT BUY this product! Read other reviews and you'll discover that this is common. I make and sell hand-made crafts, and I could not be in business without the FiberFix glue with the curing light! It is amazing! I use it to glue my products, and it is stronger than Gorilla Glue, Crazy Glue, and many other glues (I have tried at least 12 glues, putties, silicones, etc). With FiberFix, you apply a few dots of glue, then you put the tiny special light on it. I have used competitor glues with lights, and they do not work. I need a reliable glue because my business relies on it! The best part of using FiberFix is that I can complete a creation and immediately package it for shipping because the dry time is almost immediate! I buy all the FiberFix glues out at Home Depot because it is hard to find and not every Home Depot holds it in stock. I know many ways this should be marketed to women! I hope this glue becomes more widely available - it is awesome! I bought this tape after seeing online videos. I had a split in the seam of my motorcycle exhaust, and a replacement would cost over £100. FiberFix seemed to be exactly what I needed as the video made direct reference to mufflers. I followed the instructions perfectly, in fact, I checked and double-checked before attempting to use it. I applied as directed and waited the required time but it did not work. At first, it looked like it did, but after a short bike ride, it began to come off (I knew this as the exhaust noise began to return) and by the time I had got home, the FiberFix was peeling off. Not so clever after all, I guess, but it may work for some other things around the house, I really don't know. I can't use the remaining FiberFix as it is now "as hard as steel" so I guess I'll never know. And my exhaust is still blowing. I am really surprised by the negative reviews for this product; maybe people don't read instructions? Anyways, I was driving home one night when it was pouring, and my windshield wiper snapped. Luckily, I had FiberFix in my car. I used the water from the rain, wrapped the broke pieces, and seriously like 5-7 minutes later it was fixed! I was able to drive home safely. Again, I'm not sure where the negativity is coming from. The product worked really well and really fast. Tyson, thank you so much for your review! We're happy to hear that you were able to get home safely with FiberFix. We agree that the instructions can be very helpful in getting things figured out. Please feel free to reach out, if you ever have any questions. I thought this product worked great! But, as it was getting dark while repairing my PVC pipe leaks, I decided only to use a few inches of my 60-inch roll and do the remainder the next day. I sealed up the bag with the tape that it comes in and also wrapped it again with a zip-lock bag to ensure its quality. The next day my first bonded pipe was rock hard, but unfortunately so was the remaining tape that I had sealed up! So I ended up throwing away the majority of that roll. As for trying to fix a drain pipe from leaking, I would ensure that the water was drained, not dripping and completely dry before attempting to use this tape. Anyway for new users, please note that you should use the whole roll all at once. Do not use it over a constant dripping water leak. Ensure the area has been sanded, cleaned and dry. Wrap it tightly with the nylon to make it squish tight within itself for the best bond and this product will work great. Just like I said, receiving a free roll of the tape would be nice. The rest of the roll hardened up, but I will still write how great this stuff is! I bought the 4-inch by a 60-inch roll and only got to use five inches of it. It held my exhaust pipe together on my Harley. I rode like that for weeks, until I remembered it was like that. I had a leaky P trap. I went to Home Depot and saw the product with a picture of a leaky P trap. Wow, I will buy it, since it has a money back guarantee. Well, my wife and I watched the youtube video, and followed the directions to the letter, wrapping the entire 2" roll around the upper part of the P trap where it was leaking through the nut. We waited 24 hours for the cure and then tried putting the water on. Drats, same leak. I have emailed the company twice, explaining that a plumber came in and had to saw off the P trap and its extension, to rebuild the drain for only $125.00. It's an expensive trial for a product, which did not work. FiberFix glue is rubbish, do not purchase this item, glue dried up. I followed the instructions to the letter, and the tape didn't even stick to itself. Didn't seem to have any resin on it. The ladder to my children's swing set slide was broken. I didn't have the proper tools to fix it, but my husband had a roll of FiberFix. We followed the directions and applied it, and it worked perfectly! Elise, thank you so much for your review! We're glad to hear your family was taken care of with FiberFix. We wish you all the best in your future repairs. I have purchased several boxes of the rolls and two patches of the FiberFix after seeing it on Shark Tank. So far I have fixed a hose, rake, shovel, bath tub and cattle water trough. This stuff is AMAZING! I can't help but think all these negative reviews are due to human error more than a defected product, so read the instructions and take your time. It did harden fairly fast, but when fixing an item that holds water, I let it set a whole 24 hours to be sure. And it was kind of tricky to handle by myself at first, until I got a feel for how it works. Overall, I am a very satisfied customer and will keep this in my home tool box from now on. Deejay, thank you so much for the review! We're so glad to hear that product is working well for you. We agree that it is a must have for your tool box! Please don't hesitate to reach out if we can ever help you with anything. Wow, too many negative reviews, so I just had to come and post a good one. This product works great. Any negative reviews are most likely due to "user error." The product was easy to use and worked great. Read the instructions, watch the instructional video, use the sandpaper, plan out what you are going to do before you do it, and end the incompetence! 1. The "nylon tape" supplied is not really helpful. I used a clear nylon hockey tape, and it worked better. Plus, since it is "adhesive tape" it could stick to the broken item and help adhere the product better. 2. It would be helpful if FiberFix offered a "sleeve" product as well. Douglas, thanks so much for your review! We appreciate your positive response to FiberFix as well as your feedback. We agree that it is a great product! Please let us know if we can help you with anything in the future. Their is a reason why sandpaper is included. When you scuff the surface that has to be repaired, it provides adhesion to grip the tape better. Just as if someone never sanded a car before putting primer or paint on it, it will soon peel or flake off. Just a suggestion. Don't waste your money - Complete fail on leaky pipe. Sink pipe drain developed a hole causing a decent leak, much smaller than the photo of a cracked pipe on the FiberFix box I had. I followed the instructions - which did not state to use the included sandpaper. I then followed the video on YouTube. Applied exactly as described. With in one hour the drip just seemed to seep through this useless tape. Now what I have is an extremely hard as rock tape on this pipe - I started to remove it last night since this was a complete fail. Once this FiberFix tape sets, it is not fun trying to remove it. It might work fixing a broom handle, something small. As for dealing with water pipes, forget it, save your money. I used three rolls of the one-inch tape on a copper egress pipe in my basement that had a pinky-sized hole. I had used regular, self-adhering silicone tape first, but I ran out, and the pipe was still a little leaky. This stuff is what I had on hand. Even with three rolls (granted, it's a big three-inch pipe), after an hour, a single drip had formed, so I just used another roll of the four inches wide 40" tape on it. So, I agree this stuff is not wise to use (by itself) on water pipes. My recommendation it to put down a thick layer of silicone self-adhering tape (rescue tape) and then layer this stuff over the top. In the case of my copper egress pipes, which are just about shot, wrapping the entire thing in silicone tape and then using this stuff might be a lot cheaper than the $4,000 quote I got to rip out the copper and replace it. I know, who uses copper on egress plumbing? Whatever, it was during the 1950's when America "was great." Anthony, we're so sorry to hear that you had a negative experience with a water repair. We are confident when we say that we've had plenty of people with water-tight repairs that worked great! We'd love to give you another chance with our product and help you improve your experience. Please email your information to kirsten@fiberfix.com, and we'll send you another roll. I have used this product around the house and around the farm. I have used it to repair shovel handles, pitchforks, the lines and handles, and it held up well. I use these tools daily so they have to stand up to constant pressure and weight. I also needed help with some fence boards and it secured them well. Love the product and used properly, it's a life saver. Laurie, thanks so much for your review! We're glad the product worked well for you. Please let us know if we can ever help you with your repairs. I was just informed about this tape. I wonder if I can use it on a dining room chair leg that cracked. It didn't go all the way through. I don't know how it will look after I wrap the FiberFix on it either. Will it look weird? I just want to salvage the chair because I doubt that I can get a replacement. It's a black wooden leg. Thanks in advance. Write a Review for FiberFix!